An investment portfolio with ownership in producing U.S. oil and gas properties can meet a wide variety of aggressive investment objectives including high return on investment (ROI) potential, significant tax benefits, and portfolio diversification. Direct ownership in oil and gas wells may be a great way for investors to benefit from returns above and beyond most market-based investments. Improved technology and the shift to developmental, infield drilling in both proven conventional fields and unconventional shale have changed the dynamics and lowered the overall risk of investing. Improved technology and higher drilling success rates combine to set the stage for strong investment performance. 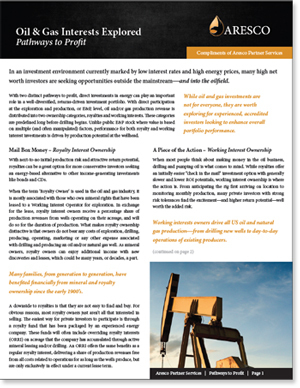 Be sure to sign up for your FREE copy of Oil & Gas Interests Explored: Pathways to Profit. Simply fill out the form to the right for an instant download. Energy investments are hard assets with low performance correlation to stocks & bonds. As a risk diversification strategy, direct energy investing may provide a buffer against fluctuating market conditions and inflation movements. Ownership in drilling programs and producing oil and gas properties offer some of the most attractive tax incentives for investments available. The IRS provides tax incentives to encourage private investments in domestic oil and gas production. For drilling investments, approximately 60-80% of well costs may be fully deductible in year one as intangible drilling costs. The remaining amount is categorized as tangible costs and may be depreciated over time. In addition, 15% of a property’s gross cash flow is tax free in the form of a depletion allowance. You will also enjoy an additional cost depletion allowance allows for 100% deduction of property lease costs, sales expenses, legal and administrative accounting expenses. Whether you are simply looking for the excitement of an investment in oil and gas exploration or are looking to diversify, we invite you to learn more to determine if an Aresco project suits your investment objectives. While direct energy investments offer many advantages, they are not without risk. Prospective partners should consult their attorney, accountant, and financial advisors before investing. (Individual Investors Only): I certify that I am an accredited investor because I have an individual net worth, or my spouse and I have a combined net worth, in excess of $1 million exclusive of primary residence or furnishings –– OR –– I certify that I am an unmarried accredited investor because I had individual income of more than $200,000 in each of the past two years or I am married with a joint income of more than $300,000 in each of those years. I reasonably expect to reach the same income level in the current year. (Individual or Corporate): I certify that I am or represent an Oil & Gas Industry-related entity. Sorry You must be an accredited investor to download this document. This is not an offer to sell nor solicitation of an offer to buy any security listed herein. Such offer may only be made by a written prospectus in a jurisdiction wherein the offering is duly registered or exempt therefrom. This content is provided for informational purposes only. Nothing herein shall be construed as tax, legal, or accounting advice. Investing in oil and gas is highly speculative and could result in substantial losses. There are no guarantees that any returns will be achieved. Potential investors should consult their attorney, accountant, and financial advisors before investing in oil and gas.